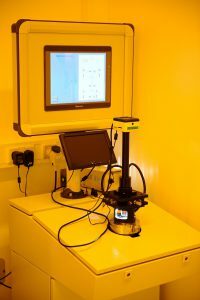 XeF2 etcher is a system to expose Si samples to XeF2 gas in a cyclic mode in which the etch chamber is repeatedly filled (~2 mbar) with XeF2 gas and pumped out again. Silicon will etch isotropically. Higher etching pressure gives a smoother etching surface. The etch rate does not depend on feature size when > 10 micron. Samples must be clean, dry and free from oxide. Apply a HF dip, rinse and bake 120 ºC.